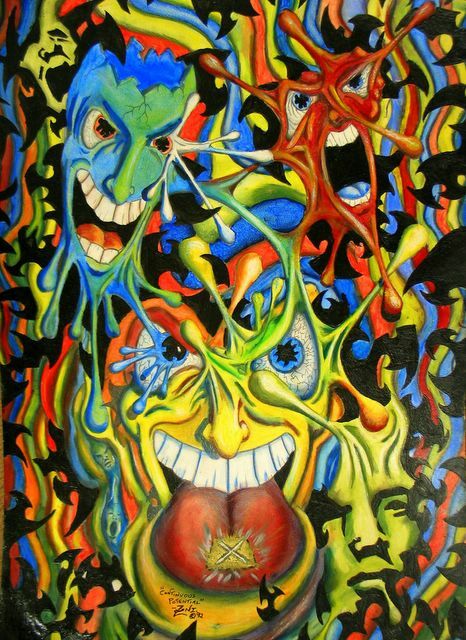 A very artistically talented friend of mine (Zoni) painted this for me during our psychedelic sessions in the 90's. I had turned him onto my excursions into the fractal dimensions of reality and their relationship to the hallucinogenic patterns we would see while tripping through the woods. In turn, he painted a picture of the good ole' Dr. X for me. It still sits outside of a frame, but it is always in my heart. Update: I have since had my friend Max frame it for me,and it hangs proudly in my living room. You really should consider framing this. With a nice matt!